Let’s face it: for all its grim-faced cheer and goodwill, Christmas is a bloody awe-full season. Before the box of torn, discarded wrapping paper has made it out to the recycling bin, we’ve moved from Christmas Day straight into St Stephen’s Day: the remembrance of the first person whose decision to follow the Christmas-babe-grown-up cost him his own life; stoned to death, his crimson blood slowly congealing, mixed with the dusty ground. And then, just days later, Holy Innocents’ Day: the remembrance of the baby boys of Bethlehem, victims of the infanticidal order of the paranoid puppet king, Herod the Great. They did not die because of their decision to follow Jesus, but as a consequence of someone else’s, the Magi from the east. (I’m not suggesting that the Magi ‘followed’ Jesus in the religious-conversion sense we often use ‘follow’ to mean today; but they did so in an arguably more significant sense: they left behind their known world and travelled into the unknown after him, and back again, a journey of perhaps four years.) Because Christmas marks an invasion, of light into darkness; the pivotal turning-point in a bleak and cosmic conflict; and there will be casualties, of combatants and non-combatants alike. And what of us? What of me? Am I willing to take the risk of being a combatant; or will I settle for the risk of being a non-combatant? Am I willing to be a combatant only in as far as my children are somewhere safe; or am I wise enough to know that nowhere is safe, and that I do my children no favours to pretend otherwise, to fail to train them in the way of combat? This is the story the season of Christmas asks me to join in. This is the story the season of Christmas sustains me in as I respond. Have a bloody awe-full Christmas…and a re-invigorated journey into the New Year. So the expectant, attentive wait of Advent is almost over for another year. And yet, that which we wait for – Jesus’ return – has not yet been fulfilled. Do we continue to wait? Yes, but we wait knowing that we cannot sustain the intensity of waiting, and knowing that we must attend to other chapters of our story. For Advent is the first chapter of our story, the story we re-tell through the seasons of the Church year. And, strangely perhaps, our story begins with a looking-forward to its sequel, which is yet to be written. It frames all that follows, with the recognition that the world is not, yet, as it should be; not, yet, as it will be. It sets the scene – the problem in need of resolution – into which the principal character – the one who will, in the end, resolve the plot – will come. The photo is of Bethlehem at night, taken from just outside the checkpoint. The photo is of a statue of Mary with the infant Jesus in the Church of the Annunciation, Nazareth. The photo is of the Church of All Nations, at the Garden of Gethsemane, at the foot of the Mount of Olives. The photo is of the inside of the Armenian Cathedral of St James the Greater and St James the Less, Jerusalem. Light penetrates the dark from above. The inside of the great dome is in the design of a six-sided Star of David. Jesus, the Root of Jesse, and Shoot of the House of David. The photo is of a carving of Christ on the Cross - which sprouts as a tree - on the outer wall of the Armenian Cathedral of St James the Great and St James the Less, Jerusalem. If so, how do you pray? And, do you find prayer a struggle? those who process through their hands (kinaesthetic)? I often use visual images as aids to prayer or meditation, such as two Orthodox icons – a ‘Pantocrator’ (Jesus ruler over all), and ‘Mother of God’ (Mary with the infant Jesus) pairing – I picked up from some charismatic evangelical Lutherans in Sweden. They sit on the bookshelf above my desk at college (the icons, not the Lutherans). My virtual friend Alan Creech is making beautiful, simple rosaries. He has a good explanation of what using a rosary as an aid to prayer is, and isn’t, here. Of course any aid or tool can become abused, but that is no reason to be suspicious of the aid or tool per se. I wonder whether this might be another baby Protestants threw out with the bath-water? 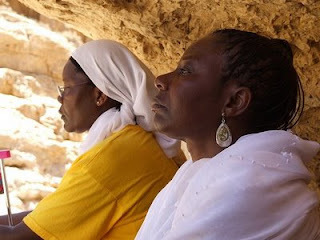 The photo was taken on a wadi walk in the Negev Wilderness. The photo is of a dove, symbol of the Spirit of Wisdom and Truth, resting on the Southern Wall of the Temple in Jerusalem. It is probable that Mary knew what it was to journey through the wilderness: the most likely route from Nazareth to Bethlehem would be to travel south down the Jordan Rift Valley, bypassing Samaria, and then climb westwards up through the Judean wilderness; and it is possible that the flight to Egypt took Mary, along with Joseph and Jesus, through the Negev wilderness rather than down the hill country and along the coastal plain. and she is the Church (whose offspring hold to God through Jesus). So Revelation 12 is not a gospel account of Mary giving birth to Jesus, but, nonetheless, Mary is integral to the vision. In the vision, God had prepared a place for the woman in the desert, where she might be taken care of – by the wilderness itself! And so we can say that, while the wilderness may not have been Mary’s home in a historical sense, it is in a symbolic sense the place, chosen by God, of her provision and protection. Likewise, though Revelation 12 is not a simplistic depiction of all humanity (through Eve), or the people of Israel, or the Church, these are integral to the vision and so we can say that the place God has chosen for our provision and protection – if we will flee into it, against all reason, for reason tells us that death alone awaits us there – is the wilderness. A great and wondrous sign appeared in heaven: a woman clothed with the sun, with the moon under her feet and a crown of twelve stars on her head. She was pregnant and cried out in pain as she was about to give birth. Then another sign appeared in heaven: an enormous red dragon with seven heads and ten horns and seven crowns on his heads. His tail swept a third of the stars out of the sky and flung them to the earth. The dragon stood in front of the woman who was about to give birth, so that he might devour her child the moment it was born. She gave birth to a son, a male child, who will rule all the nations with an iron sceptre. And her child was snatched up to God and to his throne. The woman fled into the desert to a place prepared for her by God, where she might be taken care of for 1,260 days. And there was war in heaven. Michael and his angels fought against the dragon, and the dragon and his angels fought back. But he was not strong enough, and they lost their place in heaven. The great dragon was hurled down—that ancient serpent called the devil, or Satan, who leads the whole world astray. He was hurled to the earth, and his angels with him. Then I heard a loud voice in heaven say: "Now have come the salvation and the power and the kingdom of our God, and the authority of his Christ. For the accuser of our brothers, who accuses them before our God day and night, has been hurled down. They overcame him by the blood of the Lamb and by the word of their testimony; they did not love their lives so much as to shrink from death. Therefore rejoice, you heavens and you who dwell in them! But woe to the earth and the sea, because the devil has gone down to you! He is filled with fury, because he knows that his time is short." When the dragon saw that he had been hurled to the earth, he pursued the woman who had given birth to the male child. The woman was given the two wings of a great eagle, so that she might fly to the place prepared for her in the desert, where she would be taken care of for a time, times and half a time, out of the serpent's reach. Then from his mouth the serpent spewed water like a river, to overtake the woman and sweep her away with the torrent. But the earth helped the woman by opening its mouth and swallowing the river that the dragon had spewed out of his mouth. Then the dragon was enraged at the woman and went off to make war against the rest of her offspring—those who obey God's commandments and hold to the testimony of Jesus. John was the last of the prophets to point to Jesus’ coming. And John was so expectant of this future, and so attentive to its drawing near, that John recognises and points to Jesus while they are both in their mother’s womb. And so, for Elizabeth, John’s prophetic action results in both discomfort and comfort. For this is the nature of prophecy. 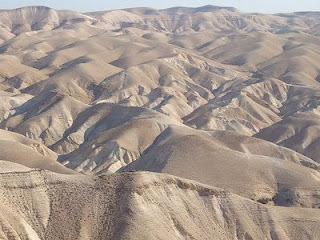 The photos are of the Negev wilderness. At that time Mary got ready and hurried to a town in the hill country of Judea, where she entered Zechariah's home and greeted Elizabeth. When Elizabeth heard Mary's greeting, the baby leaped in her womb, and Elizabeth was filled with the Holy Spirit. In a loud voice she exclaimed: "Blessed are you among women, and blessed is the child you will bear! But why am I so favoured, that the mother of my Lord should come to me? 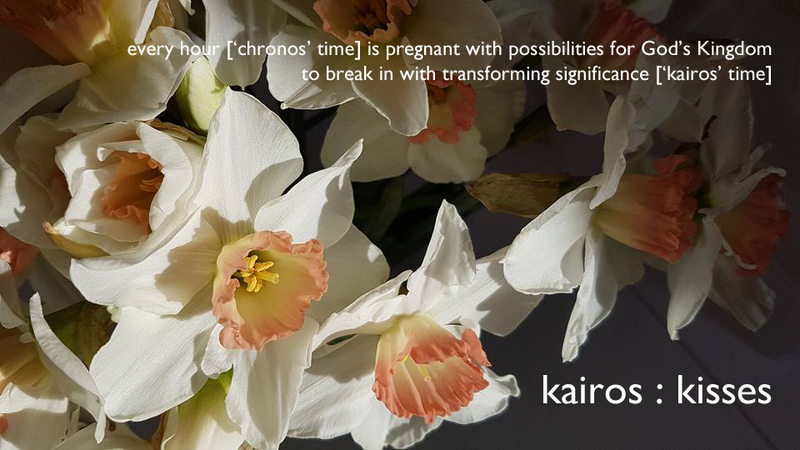 As soon as the sound of your greeting reached my ears, the baby in my womb leaped for joy. Blessed is she who has believed that what the Lord has said to her will be accomplished!" The photos are of the Judean Wilderness. and on the Fourth Sunday in Advent, to remember the patriarchs and the prophets and John the baptiser and Mary the mother of Jesus. …you also discover that God Provides. 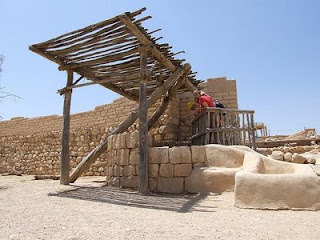 The photo is of a well Abraham dug in the Negev, on the very edge of sustainable life, some 3,800 years ago. …By faith Abraham, when called to go to a place he would later receive as his inheritance, obeyed and went, even though he did not know where he was going. By faith he made his home in the promised land like a stranger in a foreign country; he lived in tents, as did Isaac and Jacob, who were heirs with him of the same promise. For he was looking forward to the city with foundations, whose architect and builder is God. By faith Abraham, even though he was past age – and Sarah herself was barren – was enabled to become a father because he considered him faithful who had made the promise. And so from this one man, and he as good as dead, came descendents as numerous as the stars in the sky and as countless as the sand on the seashore. All these people were still living by faith when they died. They did not receive the things promised; they only saw them and welcomed them from a distance. And they admitted that they were aliens and strangers on earth. People who say such things show that they are looking for a country of their own. If they had been thinking of the country they had left, they would have had opportunity to return. Instead, they were longing for a better country – a heavenly one. Therefore God is not ashamed to be called their God, for he has prepared a city for them. To wait expectantly is to know that what we wait for is not dependent on our making it happen. To wait attentively is to know that what we wait for requires our involvement, our participation. To wait attentively is to attune ourselves to the signs that what we are waiting for is getting nearer; to recognise those things that delay its coming, and those things that hasten its coming, and to make appropriate response. Too little rain, and the farmer must water the crop; too much sun, and the farmer must erect shade. Suppose I hope to purchase something that I cannot at present afford to buy. I decide to set aside a certain amount each month towards it. Another, unexpected, expense means that I must revise the time of waiting, longer. An unexpected financial gift means that I can revise the time of waiting, shorter. Whether the day is postponed or brought forward, with each passing day I am closer to that day than when I began to wait. The kingdom of heaven on earth is now, and not yet; the king is imminent in his arrival, and delayed. To wait expectantly is to know that something worth waiting for has already begun to take place beneath the surface. The crop is growing, from seed to harvest. The foetus is developing towards full-term. What we wait for will change our circumstances, will bring with it great joy – though not without exertion and pain, when the time comes. To wait expectantly is to savour the anticipation, to resist instant and momentary gratification, to prepare for our part in bringing what we wait for to pass. And so the wait itself may change our circumstances, preparing us to receive, and to better steward what we will receive. We do not like to wait. Indeed, we have forgotten how to wait. We have actively unlearnt waiting; become progressively de-skilled. We are told, “Buy now, pay later!” Borrow what you cannot hope to pay back. We fall into recession, and are counselled by our politicians to spend our way out again, financed by greater debt. The skills we have lost are the ability to wait expectantly, and to wait attentively. I am waiting for something to arrive, a book. I know that the book exists, that it has already been published, and that it is currently somewhere between the printers and my hands. I know just what the book will look like, for I have closely studied two-dimensional virtual representations of every page (indeed, I made this book). But I don’t know just what the book will be like – its three-dimensional dimensions, its weight, the texture of the paper, the clarity of the photographs, the experience of holding it in my hands and sharing it with other people: these things are beyond my imagining. My natural inclination is to impatience. I want the book now. Worse than that: if no-one is at home when the book is delivered, I suspect that it will be taken to some depot and we will have to find time to go and collect it. Then my natural inclination will be to frustration. How unreasonable of them to come when no-one was in. How unreasonable of my wife to have left the house to shop for groceries. That is why I need Advent.